Cardiff have signed West Brom defender Darren Purse, Wolves winger Kevin Cooper and Northern Ireland international midfielder Phil Mulryne. The triple capture takes Cardiff's recruitment drive up to nine ahead of Dave Jones' first season as manager. Jones said: "We have got (Jason) Koumas, Purse, Cooper and Mulryne in and I want one or two more before we start our Championship campaign. "I now have 18 or 19 players that you can say are first-team quality." Trialist Mulryne, released by Norwich this summer, scored in Wednesday's 3-1 friendly defeat to Udinese at Ninian Park. Purse, Koumas and Cooper are expected to make their debuts in Sunday's home friendly against West Brom. Cardiff beat off Southampton to sign 28-year-old Purse in a deal believed to be worth close to £1m. Purse was a regular at the start of last season's Premiership campaign and kept his place after Bryan Robson took over as West Brom manager in November. 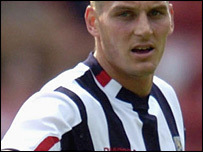 But the former Birmingham defender had not figured in the Baggies side since February and was keen to move on. Purse will provide a ready-made replacement in the heart of Cardiff's defence, following the £3.5m sale of Danny Gabbidon and James Collins to West Ham.